Percy is about to turn 16 but the possible presents aren’t what he’s really thinking about. Percy cannot help but be preoccupied about the prophecy – the one that says he could save or destroy the world. Pretty heady stuff for 16 but even Percy deserves a bit of something normal, like a day at the beach. Normal lasts until Blackjack and Beckendorf land on the hood of the car. This can only mean one thing – it’s time for war. Kronos, the Lord of the Titans, is beginning his attack on New York. Mount Olympus is virtually unguarded and the monster Typhon is heading in. It is up to Percy and forty of his demi-god friends to stand in the path of untold evil. How many will be there at the end? No matter what happens this will change the god and demi-gods forever. 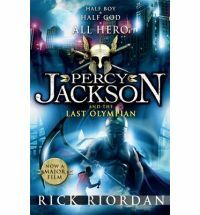 The Last Olympian is the action packed climax to the Percy Jackson series. It starts on a moment of normality then kicks into high gear. Like the previous installments it moves at a cracking pace and the only thing wrong with it is it has to finish. A fitting end for such an exciting and thoroughly fun series. Riordan has introduced a whole new generation to the realm of mythology. I am so glad Riordan continued the universe in the Heroes of Olympus books.